A pulled Borderlands 3 trailer seems to offer a closer look at the game’s split-screen co-op system. The video, which was briefly posted to Instagram before being taken down earlier today, focuses on the upcoming games’ multiplayer. This being the internet, however, the trailer was spotted before Gearbox could get it removed, and a particularly speedy fan of the series managed to capture it for posterity. It’s only a few seconds of footage, and there’s nothing drastically new on show, but this is the closest look we’ve had at new game footage since Borderlands 3 was revealed last month. The caption beneath the trailer reads “play Borderlands 3 with anyone at any time online or in split-screenco-op, regardless of your level or mission progress.” Sadly, it seems like that privilege will be reserved for console players, as Gearbox has only confirmed Borderlands 3 split-screen on Xbox One and PS4 at time of writing. If the new release is anything like its predecessors, however, you can probably expect a PC mod to show up at some point soon. In terms of new gameplay on offer, the trailer offers a look at Moze’s bear mech, the new Siren’s Phaselock ability, and multiple different environments. There’s also a brief moment in which players are driving around, suggesting that vehicle combat will look pretty similar in the new game. Borderlands 3 has already had a bit of a tough time of things. 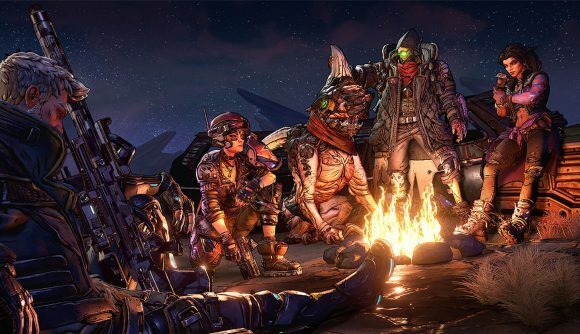 The six month Epic Games store exclusivity deal attached to the Borderlands 3 release date caused some players to review-bomb the old games on Steam. Valve have overturned those reviews now, but not before both Randy Pitchford and other industry veterans weighed in on the situation. I think it’s going to be a long five months.